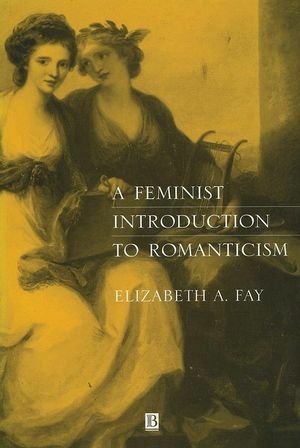 Elizabeth Fay's invaluable book addresses the student in an immediate and direct manner to provide an unequalled introduction to the issues most important for feminist analyses of Romantic literature. Elizabeth Fay is Professor of English at the University of Massachusetts, Boston. She the author of Becoming Wordsworthian: A Performative Aesthetics (1994) and of Eminent Rhetoric (1994). List of Women Writers Discussed. 1 A Feminist Approach to Romantic Studies and the Case of Austen. Feminist Theory and Romantic Studies. Jane Austen, a Case Study. 2 Women and Politics: Writing Revolution. Letters and the Maternal: Political Metaphors. Revolution as a Frame of Mind. Maternal Nationalism and Children's Literature. 3 Women and the Gothic: Literature as Home Politics. The Gothic as Domestic: Social Critique Gothics. The Romance of Real Life and the Radical Critique. 4 Women and Thought: Intellectual Critique. The Bluestocking Circle in London. Dissent and the Rights of the Home. Intellectuality and the Years of Reaction. 5 Women and Identity: Visuality in Romantic Texts. Seeing and Seen: The Writer and the Proper Lady. Display and the Specular Heroine. Tableaux Vivants, Theatrics and Burney's The Wanderer. Introduces the student to key issues. Provides new strategy for reading Romantic women's writing.